For the first time the ONS has published victim-based estimates of fraud and cyber crime for England and Wales, suggesting that together they are almost as common as all other types of crime against the person put together. Using responses to the Crime Survey for England and Wales (CSEW), it is estimated that in the year ending March 2016 there were 2 million computer misuse offences and 3.8 million cases of fraud, compared to 6.3 million incidents of other types of crime. Two-thirds of the fraud cases were bank and credit card incidents, while the most common type of computer misuse incident was virus infection. Cases of fraud have long been included in official police recorded crime data, but these figures provide at best a limited picture of the extent of the problem. Many cases of fraud go unreported to the police – for example, when a bank reimburses money stolen via credit card fraud, the consumer rarely goes to the trouble of going to the police. Plus, the reliability of police recorded crime numbers across the board has been called into question in a 2014 report from the UK Statistics Authority, citing regional variation in crime recording practices and insufficient data quality assurance procedures. To attempt to fill the gap between the police recorded fraud figures and reality, the ONS recently introduced new questions into the CSEW asking about fraud and cyber crime. The CSEW is a rolling victim based study that asks samples of people about their experience of crime over the last year. The fraud and cyber crime questions have only appeared in the last six months and as such these results are still considered by the ONS to be “experimental” statistics. However, already a picture is emerging suggesting that the demographics of the people affected by fraud are unlike that of most other crimes. 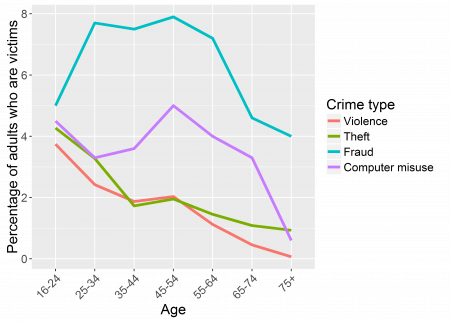 For example, while the proportion of adults experiencing violent crime and personal theft declines fairly steadily as they get older, the prevalence of both fraud and computer misuse crimes peaks in 45-54 age group. 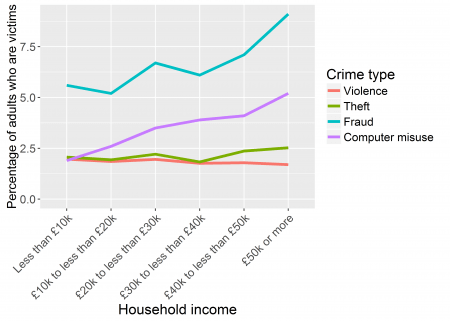 Another contrast is seen in household income, with those who earn more experiencing a little less violence but higher rates of theft and fraud than low earners. Where you live also has an effect on the prevalence of different types of crime. 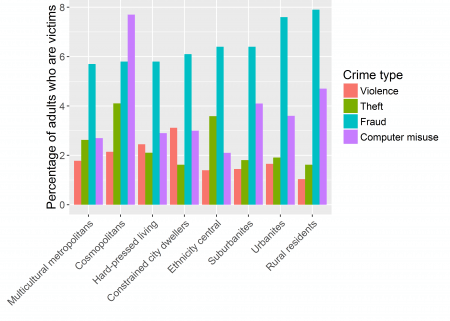 Crime has traditionally been seen primarily as a problem for city dwellers, and indeed more adults experience violence and theft in urban areas than in rural locations. But for fraud the situation is reversed, with adults in rural areas being around 10% more likely to have been defrauded in the last year than urban dwellers. 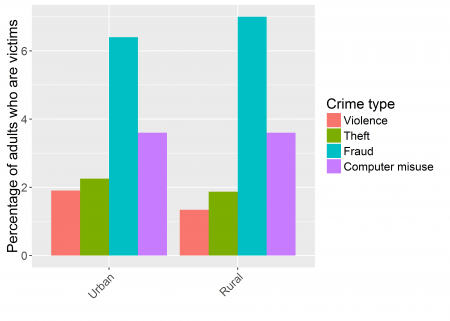 Computer misuse crimes are equally prevalent in urban and rural areas. All this suggests that fraud is a crime affecting middle-aged, middle class people, and this is borne out when we look at the data grouped by the ONS’s population characteristics classification. Those most likely to experience fraud are “rural residents”, “urbanites” and “suburbanites” – groups that tend to be UK born, own their own home, and have professional jobs or be retired. These are also the groups with the lowest prevalence of violence and theft. While these new statistics from the CSEW point towards some interesting differences between fraud and other types of crime, we conclude with a word of caution. The numbers presented here are estimates extrapolated from a survey of a sample of the population. The CSEW sample is quite large (around 35,000 people), but as mentioned above the fraud and cyber crime questions have only recently been added and the sample size for them is much smaller (about 9000 people). The smaller the sample the lower the precision of the estimate, and the problem is compounded when we split the sample up to look at subgroups of the population. For example, there is an odd spike in computer misuse crime in the “cosmopolitans” population class, a group characterised by young single adults, often students, with high ethnic integration. While cyber crime could genuinely be a particular problem within this group, a closer look reveals that this estimate is based on just 326 survey responses, suggesting that it needs to be treated with a degree of caution. Ideally all these estimates would come with an indication of their uncertainty, such as a confidence interval, but unfortunately the ONS does not provide this, nor does it provide enough information about their methodology in order for us to calculate it ourselves.